Enjoy Utah! : What To Do During Spring Break? What To Do During Spring Break? American West Heritage CenterLocated in Wellsville, close to Logan, they are having their Baby Animal Days April 5th - 7th from 10am to 5pm each day. Enjoy the Candy Cannon, pony and train rides, gunfights, kettle korn and more! Admission is $8 adults, $6 ages 3-11, and 2 and under are free. Bring a can of food for the Cache Food Pantry and receive $1 off. This Is The PlaceTheir Baby Animal Season Kickoff is going on April 5-7. Enjoy take-home crafts, fun games, baby animals, old-fashioned candy and more! Tracy AviaryTracy Aviary has a different Spring Break Camps class every day next week! Learn about nests, tweets, food and more with their variety of classes! Natural History Museum Of UtahThe newly opened Natural History Museum of Utah has their Spring Break Camp during Spring Break. They are selling out fast, so make sure you get registered as soon as possible if you plan on attending one! Thanksgiving PointAlways a fun time, Thanksgiving Point in Lehi has a lot of activities going on during Spring Break. Trilobite Treasures will have its season opening on April 2nd, as well as a variety of gardening classes, tales for tots, cooking classes and more during the week. Red Butte GardenTake a stroll through the gardens, and bring a sack lunch to enjoy. Check out a family backpack at the gift shop and explore the garden with the different activities and projects it gives you to do. Copperview Rec CenterTheir Spring Break Camp is a great way to keep your kids entertained. Boys and girls ages 5-12 are welcome. Activities include a swimming field trip, sports and games, arts and crafts, and more! Ogden Nature CenterNature's Magic and Mysteries Spring Break Camp is on Thursday April 5th. Kids will learn and get to experience all of the magic that nature has to offer. From tiny seeds to tall trees, as well as science experiments, this is a great way to keep them from getting bored.On Friday April 6th, kids will love the Animal Abodes Spring Break Camp. Learn all about the different kinds of homes that animals reside in. Gilgal Sculpture GardenThis is always a fun place to visit. Bring a sack lunch and enjoy a picnic. Historic Downtown Walking TourThere are many self-guided tours you can do on your own. The Utah Heritage Foundation has made it easy by putting them all together for you. Be a tourist in your own town! For tours in your city, check with your local visitors bureau. You can also check out my Self-Guided Salt Lake City Cemetery Tour, complete with a scavenger hunt for kids! Indie OgdenFor all things "up North", stay tuned to Indie Ogden for everything fun to do in Ogden. Hill Aerospace MuseumA FREE museum (donations are always appreciated), this is a great place to spend the day exploring and learning about aviation history. Woodbury MuseumA FREE museum at Utah Valley University, there is always something fun going on. Bean Life Science Museum at BYUFree admission! Enjoy live reptile shows, print out and complete a scavenger hunt, take an audio tour, and more! Animal Tracks at City Creek CenterThe new City Creek Center is open! Enjoy wandering the mall and finding all the animal tracks you can find. Follow the tracks to see if you guessed correctly which animal made those tracks! 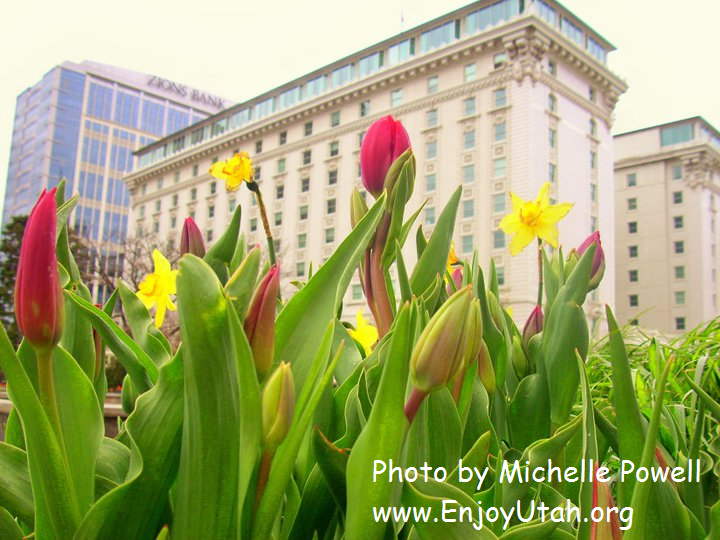 Tour the State CapitolDid you know that free tours are offered of the Utah State Capitol? Learn about the design of the building, what goes on in the building, and the new remodel to make it earthquake safe. Print out a Bingo sheet to keep the kids entertained. George Eccles Dinosaur ParkIf your kids love dinosaurs, they will love all there is to see at the Ogden Dinosaur Park! Family Friendly HikesIf you have younger children, hikes are still an option! There are many hikes you can do with younger kids, and the older kids will still have a good time. Wasatch Front Hikes With Hidden SecretsIf the weather is nice, getting out and finding "hidden" spots along the Wasatch Front is a great way to spend Spring Break! For More Spring Break Ideas...Visit our What To See In Utah page. This is perfect! Thank you so much Michelle!!! :D I knew if anyone could compile a list, it'd be YOU!